I do not know if the expected 95,000 visitors and buyers attended the Atlanta International Gift & Home Furnishings Market. And, it was hard to tell if there was more traffic than last year. But, the show definitely had a lot of people crowding the elevators, escalators, hallways and especially the large showrooms that have a wide range of products. A successful 2015 year allowed some distributors to radically expand their Atlanta showroom and for manufacturers to not only expand their existing product lines but to add new product lines. Read about the showroom expansions on "Direct from Market: Robust Atlanta Kicks Off Market Season". Examples of companies with new product lines introduced at Atlanta are Hallmark and studio•m (formerly Magnet Works). Hallmark known for its greeting cards, gifts and ornaments introduced their new line called Hallmark Home & Gifts. The goal of the new line is to "help . . . customers create a stylish, yet comfortable home." And, studio•m introduced two new product lines. One is a very unique fairy garden named Merriment and designed by the well-known artist Mary Engelbreit. The second new introduction is a collection of outdoor kinetic art named Kaleidoscope and designed by artist Carol Roeda. View videos of studio•m new product lines by clicking HERE. Every year I always look forward to seeing how the different showrooms showcase their products featuring the Pantone Color of the year. Companies always depend upon the products they already have because they have little time to prepare the display; Pantone announces the color in December and the show is in January. For 2016 Pantone announced for the first time two colors of the year - feminine pastel Rose Quartz and pastel blue Serenity. Those colors made it impossible for many companies to display their products with Pantone colors because a majority of gift companies (other than products just for women) do not use pastels on their products but instead they use much brighter, rustic, or muted colors. It should be interesting to see if the introduction of new products in showrooms at the 2017 gift shows will have 2016 Pantone colors. 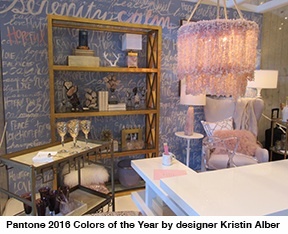 Even most of the interior designers that created vignettes for the Pantone Design Exhibition at AmericasMart did not use 2016 Pantone Colors of the year with the exception of designer Kristin Alber. She created the unusual feminine office space using products with 2016 Pantone Colors of the Year that is pictured above. I am sure there were lots of products trending at Atlanta but the show was so large I could not spot them all. Below are some that I did notice. 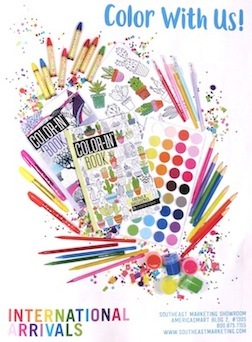 Not surprising adult coloring books predominated showrooms that sold paper products. In fact, International Arrivals and Wellspring in the Southeast Marketing (distributor) showroom sponsored adult coloring seminars by artist Joanne Fink on "How to Host Coloring party Events" and "How to Merchandise Coloring Products Well in Stores." They also had demonstrations by artists coloring the images in books that the artist had created. Read "International Arrivals, Wellspring Host Coloring Seminars at Americasmart". More companies at this show appeared to be branching out into other products lines. Not "putting all their eggs in one basket" seems to be a necessity to stay in business. For years, gift companies have been branching out with product lines that do not necessarily relate to their core products. Therefore, gift company that use to have only wall decor and figurines may now also have clothing, perfume, hand lotion and jewelry lines. The most crowded showrooms were those that had a huge variety of product lines while the showrooms that had only one or two product lines were empty. Note: To get maximum visibility of their products some companies have their own showroom, showcase their products in a distributor showroom, and may even have a booth in the temporary sections of the show. More companies are adding decorative flags to their product lines and more new flag manufacturers are emerging resulting in more opportunities for artists to license their art for flags. But the downside is that the competition among flag companies is greater which could cause less sales of individual images and not allow artists to earn as much revenue per licensing deal. Although not new, the use of LED lights on Christmas decorations, wall decor, decorative flags and all kinds of decorative glass containers was widespread. Lit up wall decor and other products are very popular with consumers and sell well according to a few buyers I spoke with. Many of the showrooms with kitchen products had very simple and contemporary looking products that had very colorful solid colors without any art. Matching trivets and other kitchen items have fret design cutouts such as chevron patterns that are very popular and seen on all kinds of products. Years ago, designs started with the fashion industry and filtered down first to the home décor industry and then to the craft and gift industries. According to well-known international trend guru Patti Carpenter*, trends no longer filter down from fashion to home décor but happen at the same time which reduces the time in filtering down to other industries. 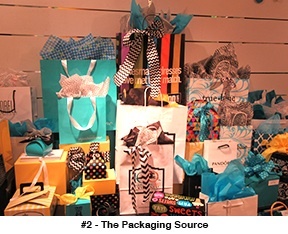 Thus, the trends in the gift industry follow the trends in fashion and home décor more quickly. Many of the designs and looks that were prevalent last year or at the 2014 Atlanta show were not as widespread this year. Some of the showrooms still display rustic distressed style art on their products but not as many showrooms had distressed products as last year. The concept of woodland creatures seems to have disappeared although owls, foxes and bears are still seen on products. The concept "less is more" of simple duo colored patterns has replaced art themes on many products such as gift bags, gift wrap, totes, plastic tumblers, etc. See below for more information about duo colored patterns. * Information from the conference "Through the Looking Glass: A Study in Contrasts" by Patti Carpenter that I attended at the show. Plaids, paisley, stylized flowers, gingham, damask, animal fur, polka dots, stripes, tribal designs and simple designs are on a huge amount of products from fashion to gift ware. Animal fur designs are trending down and not seen as often while tribal designs seem to be trending up. Polka dots, stripes and chevrons seem to be evergreen and stable designs that will continue to be used on products. Plaids are seen mainly on clothing but are also seen on plush animals and some gift products. Pastel gingham designs tend to be used for baby products. Colorful paisley and stylized flower patterns are seen on beachwear; usable products such as knifes, pens, pencils; paper products like albums and note books, etc. The most used patterns on products seen at Atlanta were simple duo colored patterns such as variations of fretwork (interlaced decorative design) and fleur-de-lis (stylized lily). Many of the simple designs are based on Gothic architecture such as fretwork and ornamental designs. These include variations of the fretwork chevron and quatrefoil (means four leaves and is four partially overlapping circles) designs. 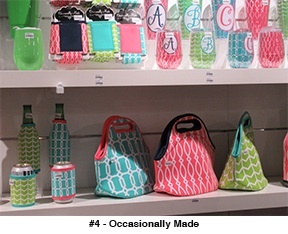 Chevron and quatrefoil designs were very prevalent on a huge variety of products in AmericasMart showrooms. 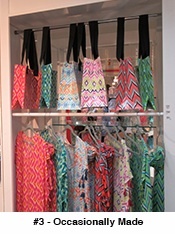 Variations of chevron designs are shown in the above picture #2 (black and white ribbon), #3 (totes and dresses), and #4 (green colored products). 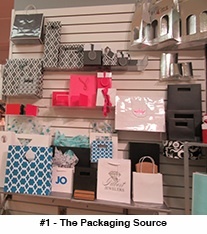 Quatrefoil designs are shown in the above picture #1 (turquoise gift bag), and #4 (turquoise colored products). White designs on black or gray give an elegant look to products and are seen on clothing, totes, purses, rugs, lampshades etc. It was obvious that a simple white-patterned design on black is VERY popular by just looking at the clothing worn by women attendees at the Atlanta show. White designs on brilliant colors give a youthful and playful look as seen on products in the above pictures. Some Atlanta showrooms still have the typical B&W chalkboard inspirational words and sayings. Words and sayings are still prevalent on wood and ceramic plaques but not all are inspirational. Also seen are inspiration sayings with colorful art, humorous sayings with colorful simple images, sayings for coastal, lodge, and man caves. And, some word(s) are manipulated into artistic shapes making it a piece of art. The coastal theme is still trending and this year mermaid images were widespread in showrooms. All shades of blues and whites were seen on coastal products but turquoise was more prevalent. Traditional Christmas colors of deep red and green was more prevalent than the playful bright red and chartreuse green. Several years ago it was predicted that Santa would take over the popularity of snowmen and that is what was seen in the showrooms dedicated to Christmas products. Although, snowmen are still popular and so are angels and reindeer. Less popular are penguins, polar bears, gingerbread men, nutcrackers, soldiers, stockings, mittens, etc. "Art Licensing Editorial: 2014 Atlanta Gift Show - trends"
"Art Licensing Editorial: 2015 January Atlanta Gift Show"